Trading stocks from the comfort of your home is one of the ultimate advantages of the technological advances offered by modern brokers such as CMC Markets. Now, traders don’t have to sit all day in offices just to keep an eye on their investments. Online trading has increased the number of people getting into stock trading primarily because of the convenience of trading from anywhere and without the need for advanced knowledge. It has provided the perfect solution for traders who don’t want to be stuck in the corporate world or only trade part-time while fulfilling other responsibilities. Online trading has given rise to another convenient approach to trading that is social and copy trading. The use of social trading platforms is not novel, but it is only currently that it has become extremely popular for several reasons. Before looking at those, it helps to understand what social and copy trading is all about. Some online brokers include features that enable traders to follow other traders such as is the case with social networks, hence the term social trading. Traders can keep an eye on what others are doing on these platforms and then use that knowledge to generate their own stock trades. Essentially, a trader mimics trades to make money. Presently, there are various social trading platforms with some being more popular than others. eToro and ZuluTrade are some of the biggest names in this business. In these platforms, traders have profiles that other customers can follow to learn more about them, which is how one can tell if a particular trader is successful or not. Stock trading requires an understanding of the market. It is impossible to get it right when you don’t know how currency exchange rates affect trades or how certain market events factor in. Even with the advantage of trading online, it would be difficult to capitalise if you don’t know anything else about stock trading. The benefit of social trading platforms is synthesised information that doesn’t take a lot of time to grasp. Making decisions regarding stock trading becomes uncomplicated, a plus point that any new trader will appreciate. Social trading platforms also allow communication between traders, which is another way to gather information. It is also a chance to network with peers and get insights into the world of trading. Navigating the word of stock trading can be quite challenging when doing it for the first time. In case you have concerns or are confused about some aspects of tarring stocks, you can message a trader who appears knowledgeable. One element that traders have to contend with when copying trades is whether to do it manually or automatically. Trading bots have been the forces behind online trading, and they facilitate automatic copying, which involves traders leaving all the work to the platform they are using. With automated copy trades, a trader does not have to monitor their stock constantly, relieving stress. Additionally, copying trades automatically saves time because all a trader only has to set the parameters of their trades and the rest is taken care of by a robot. There is no lag time when a robot is responsible for making trades, and that is one reason individuals can handle stock trading and other responsibilities such as full-time jobs. The options for automatic trading available will vary from one platform to another. Manual copy trading, on the other hand, requires a lot of work. It is most suitable for someone who has knowledge about the market and wishes to maintain control of what trades to make. A trader has a chance to monitor what other traders are doing and then decide if they want to follow those trades or not. Copying trades manually is viewed as a smart move because traders can avoid falling into traps of following losing trades. 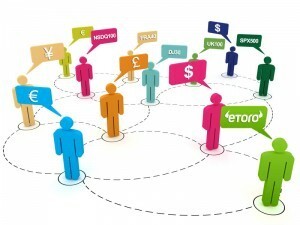 Platforms such as ZuluTarde and eToro have signal providers and popular investors respectively. These are traders that have a high number of customers copying their trades. A platform such as Currensee goes as far as to vet trades so that customers can have experts to use when copying trades. It is crucial, though for traders to understand how to use social trading platforms and the risks involved before getting started.